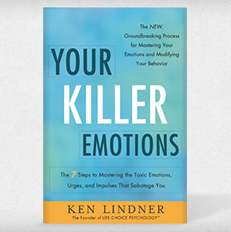 My name is Ken Lindner and I’d like to welcome you to the blog for my book, Your Killer Emotions: The 7 Steps to Mastering the Toxic Emotions, Urges, and Impulses That Sabotage You. In my thirty years of life-choice counseling experience and as the Founder of Life-Choice Psychology™, I have advised thousands of individuals and helped them to make life-enhancing personal and professional decisions. I focus on both the cognitive, as well as the all-important emotion-based components of decision making. With my guidance, those with whom I have worked are able to think with crystal clarity and free of toxic emotions. As a result, these individuals, time after time, make life choices that reflect and effect their most highly valued goals. 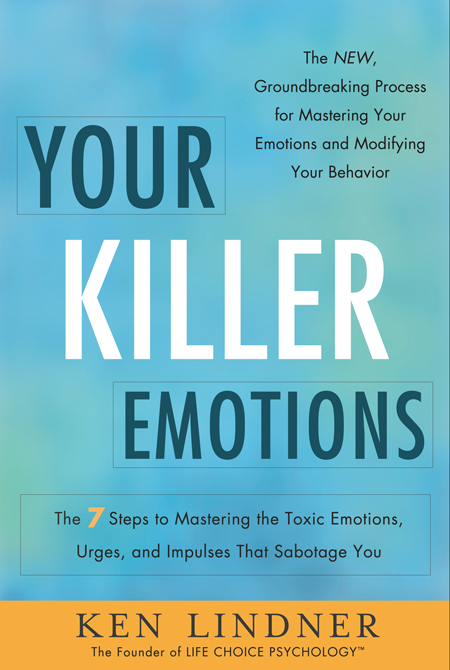 I have written Your Killer Emotions in order to share my process for mastering your emotions in order to make beneficial life choices with everyone. Have you at one time or another let your feelings of hurt, anger, disappointment, rejection, rage, betrayal, insecurity, or hopelessness cloud your best judgment? Did you make a disappointing, self-sabotaging life choice as a result? If your answer is, “Yes, many times,” then Your Killer Emotions is for you! Emotions can kill your ability to accomplish your plans, fulfill your dreams, and attain the life you so dearly want. It is my sincere hope and desire to impact the lives of everyone who has ever let their toxic emotions stand in the way of making positive life choices. On this blog, I will share components of my 7 Steps to Emotion Mastery; tips and techniques for dealing with common issues where emotions take center stage or play an influential role; and advice on effectively dealing with emotions and destructive behavioral scripts in connection with relationships at home, at work, and everywhere in between. I invite you to spend a little time with me here each week, as I will share new information, insights, and relevant stories with you. I want nothing more than to support and assist you on your journey into mastering your emotions.